Are You Bullish, Bearish, or Confused? As the benchmark S&P 500 Index soared past 2,900 in September, lots of folks were bullish. Then, stocks plunged 20% in three months. And by late December, almost everyone was bearish. Then, stocks screamed higher again. Or maybe – like a lot of other investors and traders – you were caught off-guard. So today, I'm asking you, "Are you bullish, bearish, or confused?" As a trader, you should have a working thesis for any asset class you trade. Stocks, bonds, gold, cash... What do you expect to happen in the short term? What could go wrong? How wrong? What should and could happen over the intermediate term... and the long term? Your expectations should guide your trading behavior. It may sound obvious. But lots of traders don't take the time to think this through. They hear a compelling idea, place the trade, and that's it. For example, let's say you decide an asset is in a long-term bull market, but due for a pullback in the short term. You could just buy for the long term and forget about the short term. But then you run the risk of stopping out of your position on a pullback you expected. Instead, you could wait for the pullback before you buy. But then, if you're wrong about the pullback, when will you buy? You might miss out altogether. One benefit of this strategy is that you can use a wider stop loss on the half position, without taking the additional risk that would come with a full-sized position. This makes it less likely you'll stop out on a pullback. Another benefit is that if you're wrong about the pullback, you at least have half of a position. And when you add more, your average entry price will be better than if you hadn't bought earlier. Is this the same as trying to time the market? No. It's the exact opposite. It's developing an understanding of the risk that comes with time – market volatility. Once you have this understanding, you can use it to adjust your trading strategy, and to account for the risk. So back to the opening question... Are you bullish, bearish, or confused? Most folks are confused. The market has taken a wild ride since this time last year. Will the next big move be higher or lower? Nobody knows. But confused doesn't have to mean paralyzed. As long as you know that you don't know, you can work with that. You can find great opportunities... trade them cautiously... and profit. If you don't have a working thesis, though... if you don't expect some sort of price behavior, over different time frames... you can't do any of this. You're trading blind. My advice: Hear the bulls out. Hear the bears out. And come to your own conclusions. Then, use your ideas to gain an edge in your trading. Editor's note: On Wednesday, February 13, our colleague Dr. Richard Smith is bringing together some of the most well-known bulls and bears to discuss what you should do with your money in 2019. You'll hear Steve's latest outlook on the Melt Up... Plus, you'll get insights from both sides of the debate to help you prepare and profit over the coming months. Sign up for this online event right here. "What's the biggest thing investors screw up?" Steve asks. "I've thought a LOT about that question. And I know that the answer will help a lot of folks avoid big losses." As he explains, this secret is important whether stocks rise or fall... Learn more here. "The worst time to prepare for a crisis is smack-dab in the middle of one," Dr. Richard Smith says. Read more about the strategy that can help you make better investment decisions in hard times right here: Boost Your Odds of Investment Success With This Simple Technique. 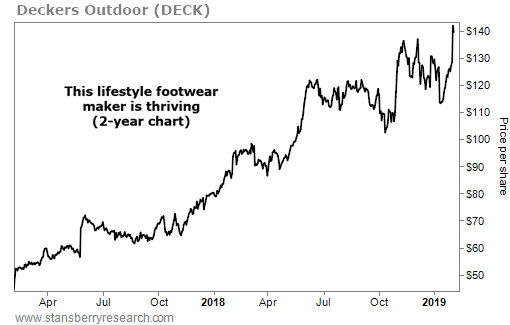 Deckers Outdoor (DECK) is a $4 billion lifestyle footwear company. It boasts popular brands like Teva (sandals) and Sanuk (flip-flops). But the company’s flagship brand is the iconic UGG. UGG makes distinctive sheepskin footwear like slippers and winter boots. The media has noted its popularity with celebrities for years. And this brand recognition is paying off for Deckers… In the third quarter, the company reported record sales of nearly $874 million, up roughly 8% from the same quarter in 2018.